Spending most of his training on telekinesis and telepathic “Force Cloaking” abilities which Wen is capable of rendering his entire presence and physical presence completely invisible, his telekinesis and force abilities are not to be overlooked or underestimated, he developed strong mental defenses and dark side resistance as well his proficiency in Jedi Tapas, which allows him to transfer the energy of the force and channel it into his blood cells and the pours of his skin to develop heat and raise the body temperature. Not only being a practitioner in intrusive telepathy, Wen is also a skilled swordsman honing the skills and knowledge of four lightsaber forms out of seven; Those being Shii-Cho, Soresu, Makashi and Djem So, he is also efficient in various force abilities which brings balance to his lightsabering combat and force skills they were very much equally balanced. Wen is also knowledgeable in constructing droids as well as his computer skills and mechanical engineering usage. Keeping a perfect balance between Wen’s connection to the force and lightsabering combat he is also known as a warm hearted and kind individual, usually putting others before himself; without a lightsaber he can be a very effective manipulator and stealth infiltrator by usage of his intrusive telepathy and “Mind Trick” techniques to have neural influence on others which he had the pleasure of learning under the tutelage of his former mentor councilor Amalia Feyn of the rannon praxeum. Born on his home planet of the oceanic world of Sembla Wen is a single Reptilian humanoid born without any siblings and no knowledge of his father who was killed in a mining accident before Wen was even born. His mother Lyra Ordo named Wen after the tides of the watery world of Sembla and random hurricanes and windstorms throughout the sea. Her heavy Vurk accent pronounced the word “Wind” as “Wen” which is how his name came about and originated from. Wen has elegant facial features and reptilian scaly skin the color of navy blue granite rocks with a sky blue crest resting in the middle of his forehead with bright orange and yellow hues. At the age of three Wen’s home village and tribe were enslaved and slaughtered by a pirate gang of mercenaries. They killed a slaughtered hundreds of Vurks and enslaved Lyra and Wen relocating them to the earthy, sandy planet called Tatooine. Little to no knowledge of his homeland of Sembla Wen was raised as a slave doing deliveries and manual labor of carrying droid parts from hut to hut to keep him and his mother’s home afloat from the mercenaries that enslaved them. He was often teased by the other children that lived in the same village he and his mother Lyra lived in. Mostly because of the way his appearance was. Being a Vurk wasn’t easy for Wen being anti-social and always keeping to himself and rarely speaking to the other children mainly because he was constantly being teased. By the age of seven he adopted the language of Huttese and spoke it fluently being his second language and basic galactic being his first. One day his mother was caught lying to one of the bounty hunter’s in the village outside of their hut. He saw his mother being beaten and slapped around in front of the whole village. His mother was suffering and being tortured by this Bounty Hunter who’s name was Jar-taan Karr. Suddenly a bright sapphire blue dazzling beam of light struck Karr and in a instant a dark brown clad figure was seen standing in front of Wen, hood over his head and only the bottom of his facial features were visible which clearly was of human descent. After the incident Lyra spoke with the man who saved their lives who happened to be a Jedi and convinced her that Wen was “Force Sensitive”. After testing him numerous times he was immediately considering him for training on Alzoc III, his mother agreed which brought Wen-Ordo across the galaxy for his training as a Jedi Knight. 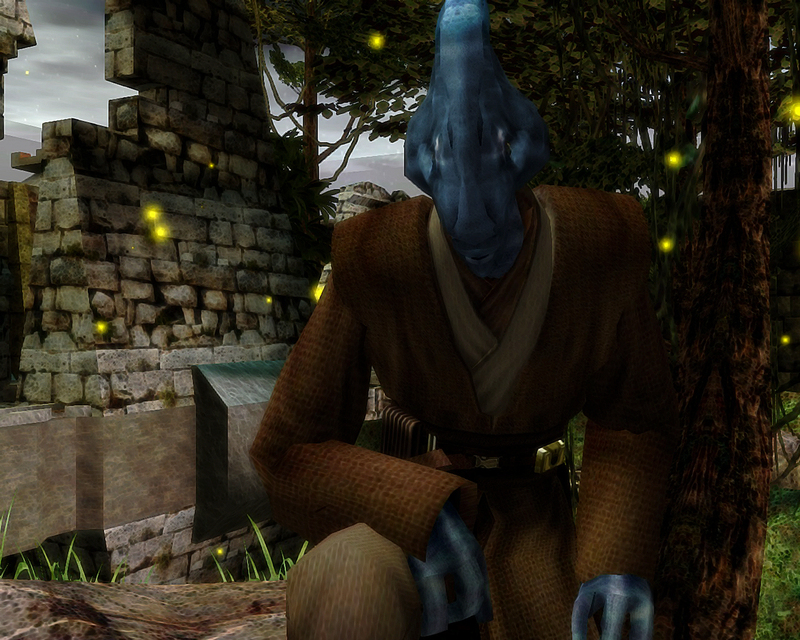 After two long years of training Wen passed his initiate trials and became a padawan learner to Amalia Feyn, Jedi Knight and Counclior to the Alzoc III Enclave at the time.Under Amalia Feyn’s tutelage he began learning telepathy as well as honing his ability with telekinesis; progressing through his training Wen had adopted a defensive lightsabering form,Form III Soresu a form Amalia had much experience in. Since the climate of Alzoc III was the complete opposite of Tatooine Wen had to learn and perfect an ability called Tapas. This way he wouldn’t freeze to death or become very ill due to his species which were cold blooded beings. Advancing in his training as a padawan learner Wen had gone on many off world trips with Amalia, she had taught him the ways of intrusive telepathy and on hiding his presence with the force as well as making his physical body invisible, this ability was also know as “Cloaking” Over the years Wen had developed a technique in resisting dark side forces as well as mentle defensive skills, having much experience with the Dark Side and engaging combat with Dark Jedi over the years with his mentor on off world trips he was also proficent in stleath infilertration and disguising himself, doing so on a few missions as a Padawan off world. After completing the rest of his training and the trials; Wen was presented along side his companion and peer Jerex Sol in front of the Council of the Rannon Praxeum and graduated to Jedi Knight. 327.21 ABY – Wen-Ordo is initiated into the Alzoc III Council. 329.03 ABY – Wen-Ordo passes his initiate trials. 329.04 ABY – Wen-Ordo is taken as a Padawan by Amalia Feyn. 340.20 ABY – Wen-Ordo is Knighted by The Council Of The Rannon Praxuem.